Curls are divine and beautiful, and even with the mess they look adorable, yet if you feel that the long curls are weighing down the style, then the need of the hour is a big chop. Short Curly Hairstyles will be the best option for this season of Christmas and New Year. A cropped curly hairstyle that is stylish and is also easy to maintain is all due to its limited length and manageability. The short strands are versatile and easy to style, and thus ladies with naturally curly hair or wavy hair should definitely try it. From the gorgeous pixies to bouncy bobs there is an unlimited option for curls, and below are some of the beautiful Short Curly Hairstyles. For the contemporary curl look, try these bangs with your super curls. The blonde curls with bangs falling above the eyes are a look that is apt for women from all walks of life and age group. Curls need to be moisturized and treated with protein so that they look full of life and have bounce and movement. To maintain the length of bangs, regular trimmings are required. Also to tame the flyways at the bangs or curls, some serum can be used. The best aspect of curls is that they need not be perfect. They look great without being perfect. The curls are short and look a little messy, but that is the best part and the fun aspect about them. However, in spite of the mess, the short curls need to be maintained well. Short coils falling on the forehead looks excellent. To keep the curls lots of moisturizing and protein treatments will be required. With some scrunching, you are done to step out. If you are confused between a pixie cut and a bob then get the better of the two. This stylishly black and silver hair that can be aptly defined as the salt and pepper look is lovely to look at. These messy curls that are done in healthy hair is a visual treat. The hair has been done in the middle partition, and few curls fall playfully on the forehead, and this adds to the cute, young and chic look. Curls are feminine and are super soft. It has that appeal of perfection without being very clean as the curls stand to be much defined. It is the good healthy shine and looks of curls that will leave all mesmerized. Good conditioning and a leave-in conditioner with scrunching and plopping will result in these cute well-defined curls. Since the curls tend to break with friction, thus while sleeping it is advised to sleep on a silk or satin pillow. Women with their natural curls can embrace their kinks and coils with a short afro cut. The style is glamorous and chic. The style is easy to maintain and looks great when left as it is. It is a style that creates excellent confidence and is meant for the girl of substance. Use some studs or rings to accessorize the curls further. Deep conditioning regime is a must for the curls. The hint of brown shade at ends with black roots adds to another texture of hair. This is a style for short blunt where there is an undercut to give a defined look to the extra volume of hair. The hair has too much of volume and the bounce. Hair is done in a side-parting, and the curls fall on the sides of the face to give a defined frame to the face. The hair can be braided or tied in a half pony to get the best look. The style is surreal and with dark black roots and the ends in brown hues add to another texture of hair. Side partition of hair with somewhat big messy waves in the short hair looks chic and ultra modern. The style needs maintenance and deep condition and protein treatment to maintain the curls. Brushing the hair can devoid it of the curls so always letting the curls to be as it will be the best option. The style is short and easy to handle still it looks very feminine and elegant all due to the short curls that help to create the sophisticated, feminine look. The curls are short, and due to the short length of hair they coil up on the head and give a very edgy look. To avoid friction in your hair, it is advised to use a serum and to maintain the curls it is feasible to prevent combing then and detangle them when they are wet and have conditioner applied to them. Also while sleeping using a silk bonnet will be of great help. To refresh the short curls scrunching them with leave-in conditioner will be of great benefit. Short high volume curls paired with a deep side part is a style that will turn eyes towards you. It is a winning look that will be envied by you. Effortless to style and easy to carry but the hard work that goes in maintain the curls is worth the effort. Condition and shampoo of the hair without silicone or sulphate products is a must. Whether you are out for office or coffee date, this style will never disappoint you. Embrace your curls and maintain the healthy curls with a deep condition and protein treatment to get the desired results. This style is ultra modern and just perfect for the ramp. All lot of products will go in getting desired results but using chemical free products will be required. The style has angled cut with the curl falling on the side. The style has jet black hair with a few strands of blonde. The curls are proper coils but with a little messy look to enhance the look. The style can be achieved with the help of a hot iron. For the bold stance on the otherwise traditional pixie cut go with shaved back. The crown will have long curls, and that can be worn forward with proper styling. The curls s styled aptly will be the crown. Use holding product to hold the curls and let them fall on the forehead. This style has stood the test of time and continues to the best choice for girls with naturally wavy hairs. Short in length thus easy to maintain yet long enough for braiding or any half updo. Will require conditioning and moisturizing to keep the curls and a lot of parlor visits to maintain the beautiful length of the hair. This style has side part with short hair in long waves. The length is up to the nape of the neck and thus has that cute chic appeal to it. Again, the curls will need lots of conditioning and moisturizing but no extra effort to style accordingly with a regular process of maintaining it and you are good to go. The evergreen short length of the hair has the best soft and short curls. The side part and some scrunching at the roots give a lift to the hair without making it look too voluminous. The curls have a defined look, and this adds to the overall sophisticated personality. The cutest style possible in short curls is definitely this one. The curls are defined and are like tendrils on the head that have been created with a hot iron. Shinning and holding products will be needed to hold the curls. It is not easy to recreate the style but the effort taken will definitely pay off. Curls need not always be bouncy at times curls without volume like the vintage style curls also create killer looks. Scrunching with heavy gel and then letting the hair dry as it will result in such curls that will be easy to handle. 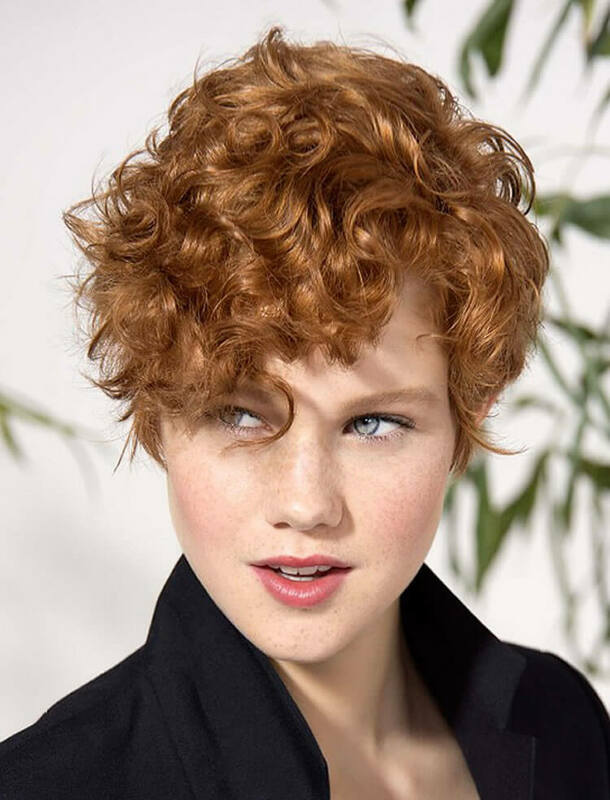 A short curly pixie is not only the practical option but also looks cute, feminine and modern. This style is ramp ready and also gives an adorable corporate look. To maintain these short curls regular salon visits will be needed and deep conditioning regime needs to be followed. The side part hair with bangs on forehead look very glamorous. The style has short length with close short coil like curls. It is somewhat like the Afro American curls, and it looks stunning. No accessories are needed as the hair are an accessory for themselves. To recreate the curls we will need hot iron or diffuser. Again these curls will need lots of conditioning and protein treatment to maintain them. This style is about how cool, carefree and wild the curls can yet remain to be feminine. The curl has been diffused, and with a holding spray they have been set on the head to create the look of the crown, and the golden tone color on the head looks perfectly suitable for this look. It is not easy to get the style will require time and artistic hand to recreate the same. The red hues in this close coiled curls look very elegant and wild at the same time. The curls fly and fall at their discretion but look so perfect. Condition and shampoo of the hair without silicone or sulphate products is a must. The short bob length is versatile as it can be left open or tied in a half updo or any braid. The style is about being comfortable in yet maintain the classy, sophisticated look. This look has short soft curls that adorn the head creating a crown on the mane. The curls can be refreshed on the non-shampoo days with water and conditioner. Yet the healthy curls are just the result of good protein and conditioning treatment. The style has short, sweet waves that are dark at the roots and blonde at the tips. The ends have beautiful curls and turns that look very chic. The back has been shaved, and the length is very short, but the front is long to be styled in good curls. The style suits girls with naturally wavy or curly hair. The style has short coiled curls that fall beautifully on the head and frame the face with perfection. The style has closed coils, and thus there is no requirement for combing. However, to detangle the hair a wide-toothed comb under the shower can be used. To avoid friction in hair sleeping on silk pillow is advisable, also using serum to tame the flyways will be needed. Tempting is the word that can be used to describe these curls. Short, and soft curls that have immense volume in it creates the wild and carefree look. The hair has light hues with dark ones, and this creates the texture that suits this style. The style will attract attention and will requirement immense protein treatment and moisturization else they will lose the curl. The curls are defined in appearance so even with the mess they are way too perfect. This style is in short hair and in spite of this fact the curls make the style look so feminine and elegant. The curls have a free spirit and fall on the crown in a defined pattern and still are simply perfect. The curls are few in tendril pattern falling on the sides of the face that is framing the face in a defined way. The hair at the back is short whereas the front has been kept slightly long to create the best pattern of swirl for the curls. Easy to maintain and style hairstyle for the women on the go. Still, a lot of hard work will go in managing the curls as lack of protein or moisture tends to break the curls. Women with thick hair and curls can sport this look. It is an uber elegant style ready for any event or office meeting. The style will take off years from your face. Women above 50 or with chubby cheeks will also look stunning in this style. The curls are a result of scrunching with diffuser and use of some lightweight gel or serum. To tame the flyways, the serum will be of help. The style will attract attention and will requirement immense protein treatment and moisturization else they will lose the curl. The curls are defined in appearance so even with the slight mess they are way too perfect and beautiful. However, the length of hair is long, but with shrinkage due to curls, the style appears to be short. This style is an epitome of modern contemporary beauty. A delightful sight that is simply ramp-ready. This Christmas season tries this trendy red style and leaves all smitten. The curls are at the crown whereas the back, and the side hair has been shaved to give a modern, clean look. The curls are defined and fall in a pattern thus they are way too perfect and beautiful. Colored curls need extra care, therefore, lots of chemical free protein treatment and moisturization will be required. Salon visits to maintain the length will also be required. Curls are beautiful, and well-defined curls are to be cherished. They are set in a few minutes, but it is the hard work that goes in maintaining them is what actually matters. Protein, moisturization and chemical free products with plopping and scrunching are the keys to healthy beautiful curls. Not much styling or setting products are needed just some gel or serum are the basic requirements for the curls to hold their defined shape. 20 Most Alluring Stacked Bob Haircuts to Try Before the Year Ends!